If you haven't heard of the Rising Tide Society yet, you must check it out! It's an organization with meet-ups around the country that bring creative together to learn, network & promote community over competition. It's a mission I wholly believe in. Over the past 8 years of blogging, I've seen people collaborate and lift each other up & on the flip side I've witnessed jealousy and bitterness. I promise you if you care enough about your blog or business, there is room for everyone to learn, grow and find their niche! Last night, I had the opportunity to speak at our local Madison meeting about Instagram! With a room of 20-or-so entrepreneurs we had open conversations & I shared my most valulable learnings about the platform. I shared a few tips that have taken me a couple of years of testing & analyzing the platform to figure out. Imagine how much better bloggers & business owners we can be if we work together to empower each other rather than view each other as competition! 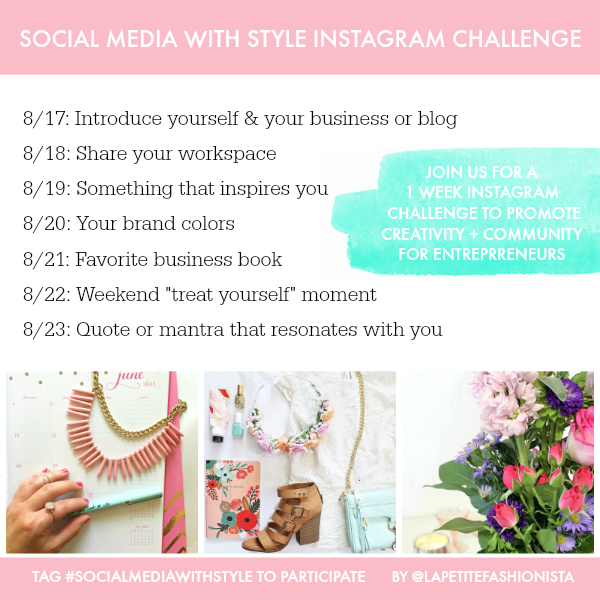 In the spirit of helping each other reach new heights and opportunities to get creative on social media I'm launching a fun little Instagram challenge for next week! You can participate as much as you'd like in the "challenge", just use hashtag #SocialMediaWithStyle on your image! Take the opportunity to connect with fellow go-getters & entrepreneurs and have fun! I'll even be granting one person (at random) who participates a free 30 min social media strategy chat with me! On a final note, in my talk I spoke about the importance of finding "your people". La Petite Fashionista readers (new & old! ), I just want to thank you for being my people. Thank you for sticking with me as this blog went through the evolution of a high schooler with big dreams to college fashion student to a #girlboss trying to learn the ways of adulthood! Cheers to big dreams & getting there together! P.S. Looking for Instagram tips? Check out a few of my biggest takeaways here.